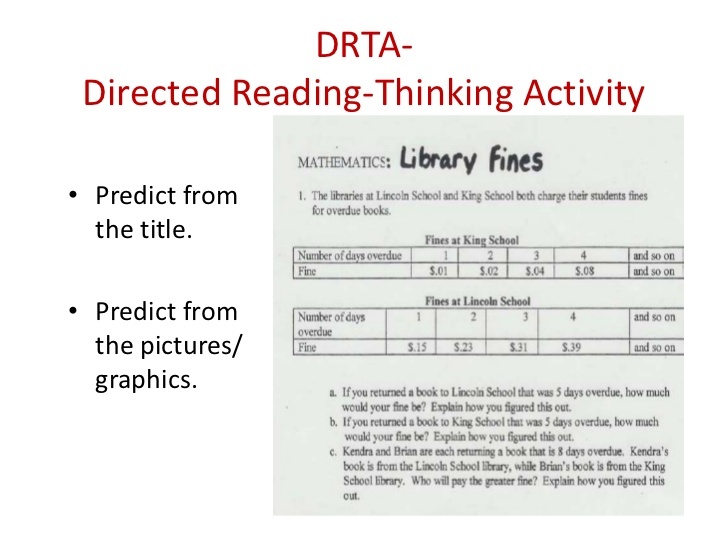 Definition/Description: The Directed Reading Thinking Activity (DRTA) is a comprehension strategy that is used during reading to guide students in asking questions about a text and making predictions. They then keep reading to figure out if their prediction was correct or not. This can be done individually, in a small group, or as a whole class. "The DRTA process encourages students to be active and thoughtful readers, enhancing their comprehension" (Reading Rockets, 2015). Typically the teacher will read students the passage and have them do the thinking and predicting part. "These predictions, and confirmations (or revisions) guide she students' understanding of the story (Jennings, Caldwell, andLerner, 2014). This video is VERY informative on what ​Directed Reading Thinking Activity (DRTA) is and how to implement the strategy in a classroom setting. This strategy is good for all students, especially those with learning disabilities and struggling readings, mainly due to the repetition within the strategy. Many students with learning disabilities and or struggle need repetition within the same content in order to start to gain an understanding (Hallahan, Kauffman, and Pullen, 2015). Also this strategy gives students time for thinking, they are constantly predicting what will happen, justifying and explaining, and going back to see if the prediction was correct or not and fixing it if not (Jennings, Caldwell, and Lerner, 2014). There was a study done by Schorzman and Cheek on the effects of the DR-TA along with a pre-reading plan and graphic organizers. It was done among three middle school classes and compared to a control group of three other teachers at a different middle school. The results indicated that these strategies used together resulted in significant pre-post student gains on a cloze test (Schorzman, E. & Cheek, E. (2004). If teachers use graphic organizers as an after activity this will help with the visual representation of students. "Research findings indicate that graphic organizers can be effective tools to support comprehension for all students, including those at risk for academic failure" (Miller, and Veatch, 2011). 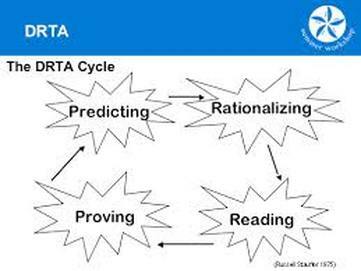 DR-TA allows students to higher-order thought processing and provides teachers with a significant amount of information about each student's ideas, thought processes, prior knowledge and thinking skills. (Tankersley, 2005). Choose a text to be used and have select points for students to stop during reading . Introduce the text, the purpose of the DRTA, and review predictions. R = READING. Students read the first section the teacher choose at stop, and they answer the questions the teacher asked about specific information and asks students to evaluate their predictions and refine if necessary. This is continued until students have read the whole section for the day. Break readings down into smaller chunks. Allow longer time to process information. Writing may be included, use this for advances students or for student who learn best by re-writing information, visualizing it. Use small groups to help collaboration and depth of predictions. ​The purpose is to help encourage student to be active and thoughtful reader and to activate prior knowledge and background knowledge to gain a better understanding of reading and the material. Also it helps student develop monitoring while reading, because they are always checking to make sure their prediction are right and they are understanding. Lastly, it uses critical thinking skills, which is necessary in the 21st century. This video starts with the definition of Directed Reading Thinking Activity and some points that teacher might find useful. Then it goes into an example of teaching special education students using this strategy! The video above is an amazing video done within a special education classroom for learners with different learning disabilities. As you can notice the students have different learning disabilities, however this strategies works for them. I am going to focus on a student I had who had down syndrome and why I know this strategy would help her. Most students with down syndrome are still able to function and do a lot of the learning on their own. Also, they like to be involved and apart of the class. As stated in our book the key to success for many students with down syndrome is, "intensive and strategic instruction, relentless collaboration among team members, and specific goals and social supports" (Hallahan, Kauffman, and Pullen, 2015). In this strategy students are collaborating with other students and this allows them to feel apart of the class and a sense of belonging. Also it states students need specific instruction and this strategy is specific and repetitive. Students are constantly thinking about the reading. The specific student I had in my class always wanted to be in the classroom and collaborating with her peers, and by using the DRTA strategy it would have allowed her to stay in the mainstream classroom and still receive the support she needed to learn as long as her para was there to assist. This strategy can be used in any subject not just reading. It can be used in math, science, and social studies as well. The video above is done in a special education room and demonstrates that this strategy can be done and is useful for students with learning disabilities. The picture above demonstrates an example of how DRTA can be used in math. In this example students make a prediction based on the title, picture clues, and graphics, they read the material, such as a short story about the topic or questions. Students then assess their predictions and adjust them and the answers if need. Students can read a book about a science topic or social studies topic and go through the steps. For example student read a book about the life cycle and go through predictions and the process. Or it could be something similar to the math example to the left! ​Jennings, J., Caldwell, J., & Lerner, J. (2014). Reading problems assessment and teaching strategies. Boston, MA: Pearson Education, Inc.
Schorzman, E. & Cheek, E. (2004). Structured strategy instruction: Investigating an intervention for improving sixth-graders’ reading comprehension. Reading Psychology, 25(1), 37-60.